Whether you are a long-time eBay buyer or you’re just starting out, you’ll want to be confident that you are getting the best deal available. eBay is full of bargains but are you really finding them? Or, are you still paying more for items than you need to and buying from potentially problematic sellers? Here we list 33 of our top tips for buying on eBay, so that you can be sure that you’re getting the best deal every time and avoid running into problems. 1) Be careful not to buy on a whim – This is easy to do when you see something that looks nice and seems like a bargain, but you will probably find out later that you could have got it cheaper if you’d taken a little more time to view similar listings. You might also have been able to pick up the same item, for a lower price and in better condition. 3) Use ‘items ending soonest’ to grab a bargain – Like our last point, if you find yourself online at a time when others are not likely to be bidding, use your filters next to the search bar to switch to ‘items ending soonest’, bringing them to the top of your search feed. You will want to have done your research prior to this so that you know how much items usually go for, just so that you don’t end up buying on a whim as we mentioned in point 1. 4) Make good use of filters – We’ve already mentioned one filter you can use in that you can see the items ending soonest at the top of your search feed. There are various other helpful options you can choose, though, such as listing items by the cheapest first or the most expensive and you can also choose for postage and packaging costs to be included. Another option is to place newly listed items at the top of the search results, which is helpful if you’ve been searching for something for a while and don’t want to trawl through the same listings again and again. 5) Look at completed or sold listings – As well as using filters, you can also use the advanced search feature to search previously completed or sold listings. (On a mobile I think this is still found under filters) Why might this be helpful? It’s helpful because it will give you an idea as to how much similar items have sold for on both auction and Buy It Now in the recent past, so you’ll know whether you’re really getting a bargain or not. The only price you won’t be able to see is the best offer price which was accepted by the seller if they chose to sell an item this way. 6) Stay away from 0% feedback sellers – I must admit that I feel a little bit mean saying this, as I know we all had 0% feedback when we started out buying or selling, but in general I would have to advise any eBay buyer to be wary of 0% feedback sellers as buying from one could easily lead to a bad experience. 7) Check feedback if it’s low or less than 100% – To follow on from our last point, if a seller has some feedback but it is very low, either in the amount of people who have bought from them or the overall percentage feedback, then it would be a good idea to look closely at the feedback that they have received to see whether it is feedback from selling to others or from buying only. If they have received some negative feedback, what exactly was the problem and did the seller get the issue resolved? This should give you a better idea of whether you really want to buy from them or not. 9) Don’t be tempted to deal outside of eBay – Sometimes you might be asked by a seller to pay for an item outside of eBay or with cash on collection. They may even offer you a small discount to pay this way too, as it may mean that they save money on paying eBay or PayPal fees. Of course, it’s up to you if you want to take the risk or not in order to save a few pounds or dollars on an item, but I personally think you should always pay by PayPal if the option is available, as this will protect you should you have any issues. 10) Think twice before buying from overseas – These days you will notice that more and more items are available cheaper if you buy them from sellers in another country – like China or Hong Kong for example. I personally don’t buy from these sellers as I don’t think it’s worth the hassle, but if you find you’re tempted then here are a few points to consider. 1) How long will delivery take? 2) How will you return the item if it isn’t what you expect it to be? How much will this return cost? 3) Will the item be subject to import tariffs when it arrives in your country, making it a lot more expensive than you thought it might be? 11) Don’t assume auctions will be cheaper – You could be forgiven for automatically assuming that you’ll be able to pick up the best bargains buying on auction. Often times, though, this is not the case. I regularly see people bidding silly prices for auction items when they could pick them up much cheaper by looking at the ‘Buy it Now’ listings instead. Something to keep in mind. 12) Set your limits and stick to them when buying on auction – It’s so easy to get carried away when you’re caught up in the excitement of an auction. When you’ve been watching an item all week you just want to win it, and sometimes you can overbid because of this. It really is better to set the maximum price that you’re willing to spend before the auction reaches those tense latter stages, and then stick to those limits. Remember, there will almost always be another bargain just around the corner, so missing out on the odd item isn’t the end of the world! 13) Check the returns policy – Not every item you buy on eBay is going to be exactly what you expected it to be. This is why it’s a good idea to check the returns policy before you buy, as the terms may differ from seller to seller, with some sellers not offering returns at all. It’s good to check whether the seller offers returns and if so, whether they expect you to pay for the return postage and whether any initial postage costs will be refunded to you. 14) Know your rights as a buyer – When you buy something online in the UK you are automatically covered by distance selling regulations which basically state that you get a 14-day ‘cooling-off period’ when you buy something you have not seen in person – unless it’s bespoke or made to measure. You can read more about your rights as an online buyer here. 15) Always factor in postage costs – Just because an item has the cheapest list price on eBay this doesn’t mean that you are getting the best deal, as once you take postage costs into account you might have been better off buying from another seller with a higher list price and lower delivery charges. A quick way to find the lowest priced item including P&P is to again use the filters next to the search bar. 16) Look for combined postage discounts – if you are buying more than one item and they are similar, then it might make sense to try and buy them from a seller who offers combined postage discounts. This basically means that if you buy more than one item, they may discount the postage on the second, third and fourth items and so on, as they can send them all in one package and pass the savings on to you the buyer. If you want to buy more than one item from a seller and they don’t offer combined postage discounts, then it might also be worth sending them a message to ask if they would mind setting it up as a buying option. 17) Keep an eye on the Daily Deals Page – One of my favourite places to find great deals on eBay is the eBay Daily Deals page*. This page lists the best deals on fashion items, home, electrical, outdoors and many other categories. 18) Be realistic with your best offers – Some Buy it Now listings on eBay will also give you the option of making a best offer. While it may be tempting to make a cheeky offer to try and get the best price possible, keep in mind that other people might well be making offers too. Over the years I’ve found it best to be more realistic and just offer what I’d be happy to pay. 19) Always Factor in Collection costs (and time) – Although the price of an item may appear to be cheap on the surface of things, it may turn out to be not so cheap if you need to spend a lot of money on petrol to collect it from far away, or you may even need to hire a van or use a specialist eBay courier*. So, be sure to account for collection when working out how much money you are prepared to bid for an item. You should also consider whether it is worth your time to travel a long distance to collect an item and also whether you will need to rope in the help of a friend to help with the heavy lifting. 20) Don’t be fooled by ‘free shipping’ – Free shipping may seem like a great deal at first glance, but if the item can be found elsewhere on eBay for less money even when shipping has been included, then it is not such a great deal after all. 21) Don’t assume anything – When buying on eBay, it can sometimes be useful to use a little common sense when examining a listing, as it could help you to pick up a real bargain. My wife and I once spotted a Welsh Dresser on eBay, for example, and the dimensions stated that it was over 2 metres long! This made it much too big for the room we wanted to buy it for. After looking at the photos, though, it was easy to see that the dimensions had been incorrectly stated and that the dresser was actually a lot shorter than this. We ended up getting the dresser for a bargain price and I feel that this had a lot to do with the wrong dimensions in the listing and that this may have put others off making an offer. 22) If the price difference is small, go with the trusted seller – If you find a few sellers selling the item you want at a similar price on eBay – which is often the case when buying a brand new item – I feel it makes sense go with the seller with the best (and most) feedback compared to a seller with little feedback. Is it really worth risking a bad experience just to save a few pence? 23) Link Your Nectar Card – Did you know that UK eBayers can link their Nectar card to their eBay account so that every time you make a purchase on the site, you will automatically receive some bonus Nectar points too. You can learn more about this on the eBay website*. 24) Don’t assume eBay will always be cheapest, check Amazon too – While this tip may not be related to saving money on eBay, it will still save you money if you manage to find a better deal on a site like Amazon*. 25) Scrutinise photos – Taking the time to carefully scrutinise any photos listed by an eBay seller can really save you time and hassle in the long run if you end up having a dispute with a seller. If you spot some signs of damage or something else you’re not sure about on the photos, then be sure to ask the seller about it, just so that you have some comeback should the item arrive and it is not in the condition you expected it to be in. 26) Confirm potential delivery dates – If you need something quickly, then be sure to check the feedback of the seller to see what others have said about their stated delivery times. If you’re really unsure and don’t want to risk it, then content the seller before buying and ask them whether they can definitely get the item to you by the date you require. The seller may even offer to ship the item out quicker if you take this approach. 27) Is the postage or shipping insured? – If the item you’re buying is expensive or rare, are you happy with the delivery method? For example, is the delivery trackable and is the delivery insured? If not, then you may be able to arrange for the seller to send the item in a different way if you are willing to pay a little extra for the peace of mind. 28) Factor in potential delays on delivery – If you are buying around Christmas or at a time when there are postal strikes going on, be sure that this will not delay your delivery and consider paying extra for expedited or guaranteed delivery if you need the item fast. 30) Is the item from a smoke and pet free home – If you are buying an item on eBay and it doesn’t list whether it is from a smoke and pet free home – and this is important to you – then be sure to ask the seller. 31) Watch out for fake items! – If you’re worried that an item may be fake or that a price seems simply too go to be true, then be sure to have another look at the seller’s feedback to see what others have had to say about the specific item you are looking to buy from the seller. 32) Colours aren’t always as pictured – Another point to keep in mind is that photos from eBay sellers don’t always accurately show the colour of an item. If you feel that there may be an issue in this area then don’t be shy to ask the seller to send further images, perhaps taken in a different light or at a different time of day. 33) Stay safe – Finally, we’d like to encourage you to stay safe when collecting items in person. It would be wise to always take a friend with you when collecting an item and to be careful what personal information you give away to a seller or buyer online. 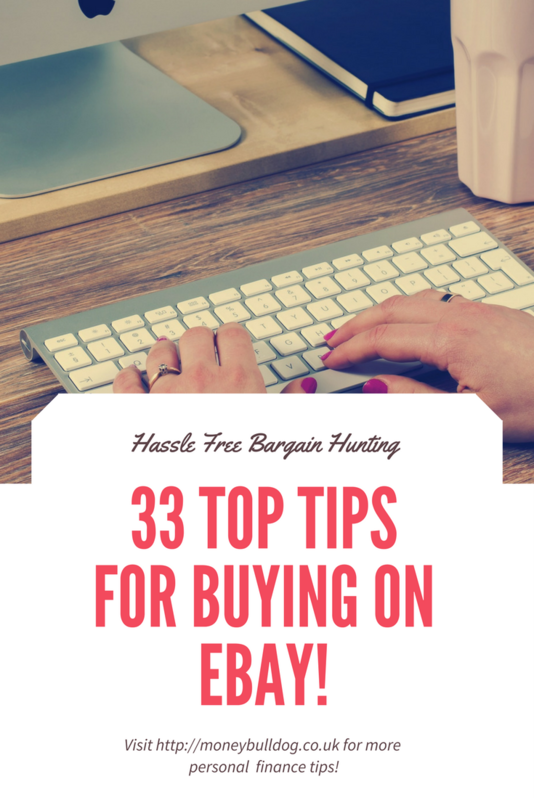 So, there we have our 33 Top Tips for buying on eBay! We truly hope that these tips help you to find a good deal and have a better eBay buying experience. If you have an eBay buying tip you’d like to share, then please do leave a comment below!